One quiet August morning an alleged double murderer leaves prison. One rainy April day the next year a mutilated human body is found in a ditch. Is there a connection? Superintendent Van Veeteren is faced with an unhappy human destiny - and a case in which all the leads take him back in time. 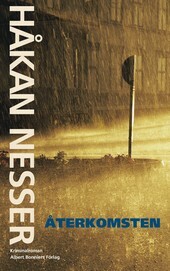 The return birthmark is the third book in Håkan Nesser’s series of ten novels about Superintendent Van Veeteren and his colleagues in the police force in Maardam.